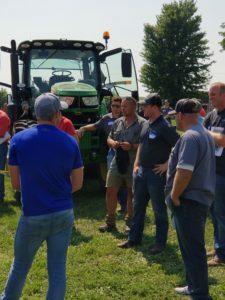 Our Field Day in Kennard, NE was a great success. Over 90 growers and Ag industry leaders learned about the compelling economics of transitioning to organic production. 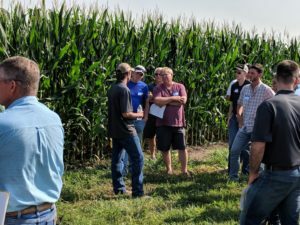 In addition, participants received expert insight into the transition process, production practices, hands-on demonstrations of weed management equipment, and toured organic corn and soybean fields. Visit AgriSecure’s Facebook page to see images more images from the event. Thank you to everyone who participated, the amazing AgriSecure Team, and Farmer’s Business Network. For most, crops are in the homestretch. Corn is starting to pass dough stage to early dent and soybeans are filling pods in a late push into reproduction. If your crops are irrigated, keep watering until maturity; with corn watch for the abscission (or black) layer to form and with soybeans look for the first yellow leaves. A common (but costly) mistake is made when growers stop watering prematurely – as it can easily result in a 10% end of season yield loss. As you know, the 2018 growing season has been all over the board with the extremes of way too wet and way too dry along with other adverse weather events such as terrible winds and/or hail. The impact of weather has varied based upon the crop and stage – and we hope you have fared better than average. Multi-crop organic rotations do provide the benefit of a natural hedge against risk and weather. AgriSecure has had discussions with growers recently hit with hail. When this occurs, it is important apply a fungicide along with copper hydroxide. The fungicide will give the plant additional disease fighting strength and the copper will cauterize the tissue to prevent disease from entering the plant. We cannot overstate the importance of these two critical steps when a crop has been injured by a storm – so please apply both products as soon as possible (via airplane, helicopter, or ground rig). If you have any questions, please reach out to an AgriSecure Account Executive. With harvest around the corner, we must have a post-harvest plan in place for each field. For example, cover crops or small grains (e.g., winter wheat) plans need to be finalized soon. Many believe cover crops are not as important as cash crops, and therefore do not put sufficient effort into planting and seeding plans and execution. However, AgriSecure urges clients to be diligent with fall plantings by ensuring a proper seed bed and getting the seeding rate correct (e.g., including a 10% buffer to ensure a good stand is established). Cover crops play an important role in weed suppression and nitrogen build-up for the next season, not to mention the billions of soil microbes the roots feed throughout the winter. If you would like support developing a post-harvest crop plan, please contact an AgriSecure Account Executive for advice. The final bushels of the 2017 crop are being moved to make room in the bins for the new crop that will be harvested soon! Where did the summer go? Most AgriSecure growers have markets for the 2018 crop. Please let your Account Executive know if your production estimates indicate you may have additional bushels available. Extra potential bushels to contract is a great problem to have and AgriSecure can deliver options that fit your needs. Thinking Ahead (about 2019): AgriSecure has been working with our customers to design rotations based upon operational and financial factors – and we will start considering sales opportunities shortly. 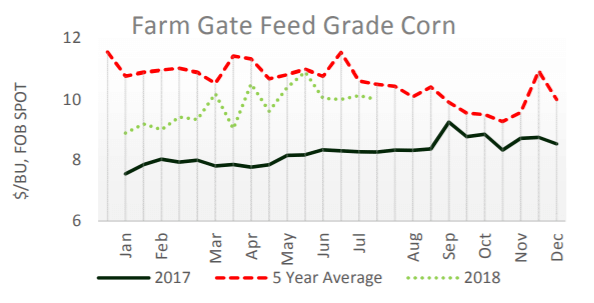 We believe companies will start to release their 2019 projected prices within the next 4-8 weeks – and we want to be positioned to leverage this information to provide the best solutions for your farm. Consider Wheat: Winter wheat is a great rotational crop to consider for both transition and organic production – with food and feed grade options available. For example, organic feed grade prices are currently in the $9.00-10.00 per bushel range (depending on quality). If you will be planting winter wheat, now may be a great time to enter into a marketing agreement. 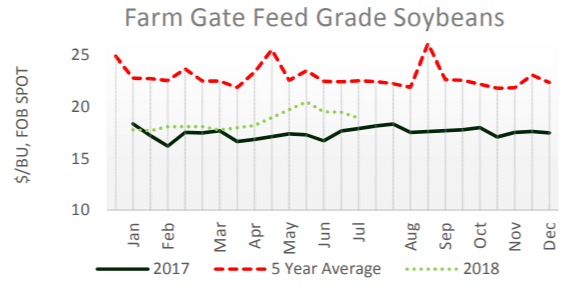 As highlighted below organic corn and soybean markets continue to maintain strength, which is reflective of the expanding organic market and the demand for high integrity, verifiable organic products.